I decided to take a red-eye from Seattle to Orlando. It was actually more expensive to take the red-eye, being a direct flight, but I thought this would be the best way to get Miss V to Orlando with the least chance of an incident. With any hope she’d sleep the entire trip. Miss V still qualifies as a lap infant, so I gambled that I might be able to get a free seat for her if one was available. We went through security, which wasn’t nearly as bad as I expected. There was a family and wheelchair line which moved fairly quickly. I had filled a couple of bottles with powdered toddler formula, and planed to buy a water bottle after security to mix them. I was a tiny bit concerned TSA would stop me for a “fine white powder”, but they moved me right along, thank god! 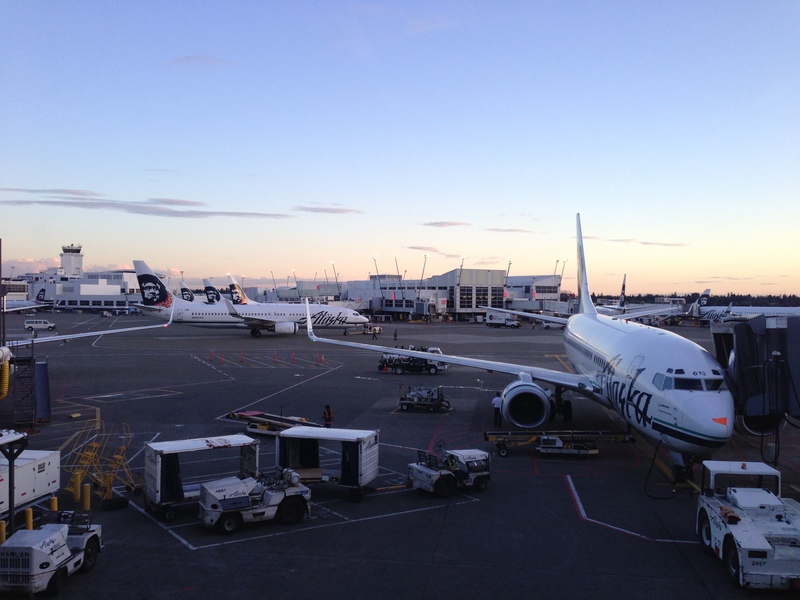 I assume because SeaTac is on a high plateau, there are different elevations in the terminal. It took a bit of navigating with the stroller, and I believe there were two elevators down to the gate. Alaska Airlines has digital display boards showing how many people were checked into each flight. Ours showed 150 checked in for a total of 168 seats. I asked the gate agent about a seat for Miss V, and she said she could move me to row that would probably stay empty. Score!!! Knowing that I had a seat was a great relief. Miss V was a bit fussy, so we did laps around the terminal. One thing that I love about SeaTac are the family restrooms, which are everywhere. It’s a private restroom large enough to hold a big stroller and baggage. I really enjoyed the privacy while attempting diaper changes. Boarding started much sooner than I anticipated, at about 9:15. I brought Miss V’s carrier carseat with us, as she still meets the guidelines for it. However, we’ve switched her into a convertible car seat at home. 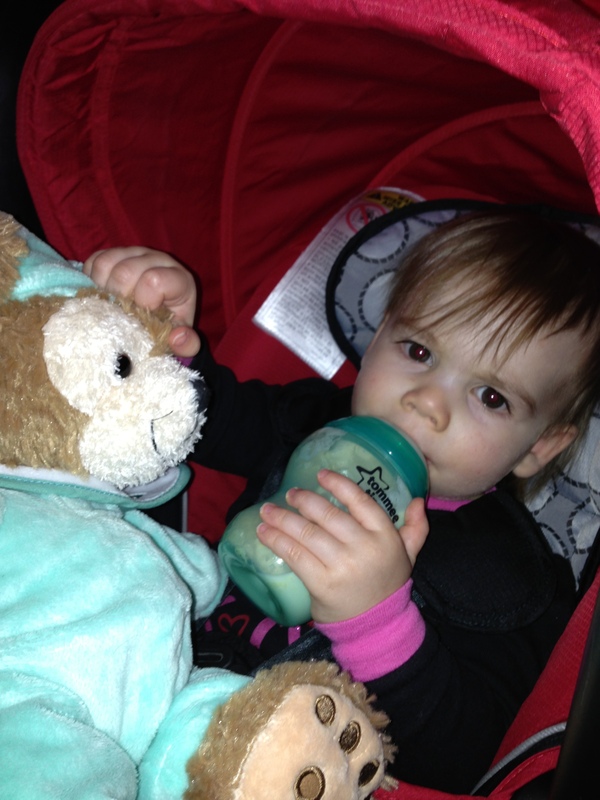 This was a good choice as it clicks into our stroller, and was light enough to carry on the plane. Our Britax Advocate would have been a nightmare. 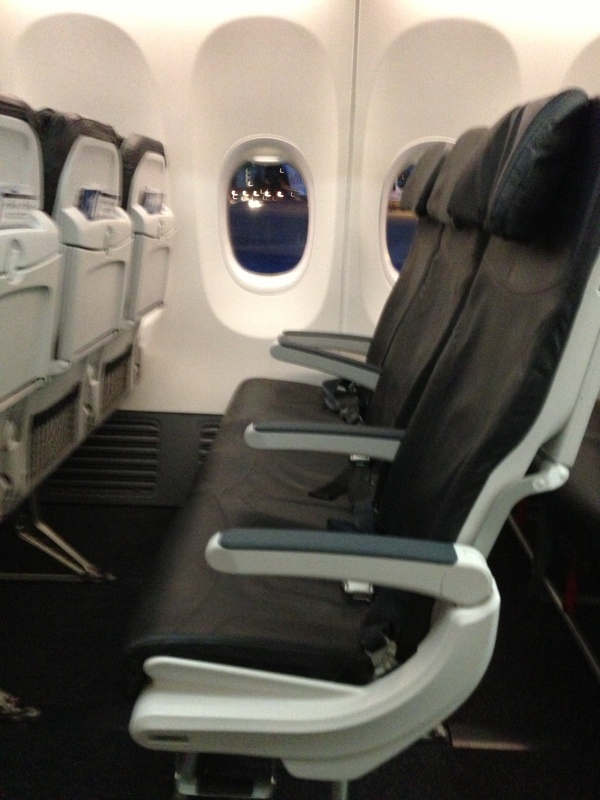 We were also lucky our plane was a brand-new 737-900 ER which had slim seats. They were comfortable, and even had what I call “head wings” which were adjustable. It definitely felt less claustrophobic than other planes I’ve been on. Miss V fell asleep pretty quickly. I have a history of not sleeping on flights, and this one was no different. Overall the 5-hour flight was pretty uneventful. After deplaning, we quickly made our way onto the tram for the main terminal, where my Dad, stepmom and sister KE were waiting for us. They had gotten up seriously early! The flight landed at about 6 am local time. It was wonderful to catch up, and we were soon on our way to the Space Coast were a large contingent of my family lives. After a quick breakfast, it was nap time! In the early afternoon my other sister, KG and her kids, and brother in law, came over to visit. It was great! 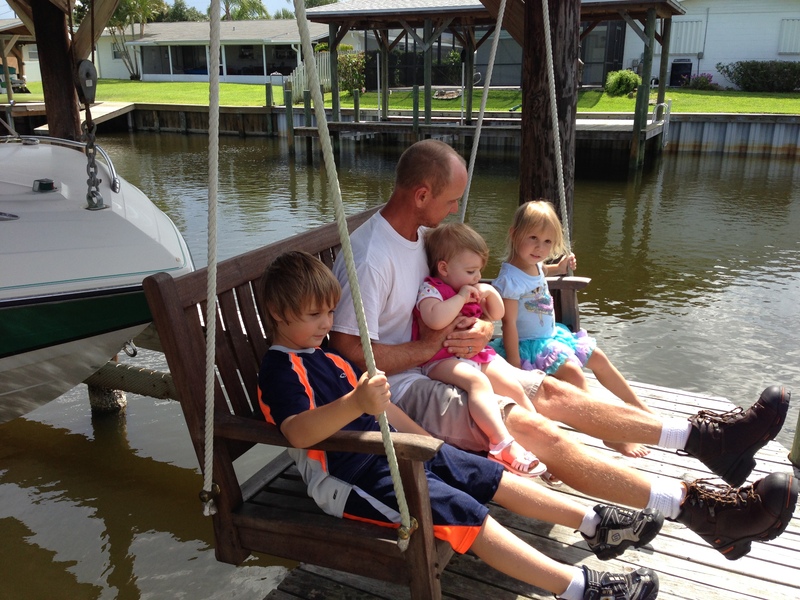 The kids had spotted a manatee and were watching it on the swing. KE and KG wanted to have a sisters afternoon and go to a movie. So we went to see the new Star Trek flick. Grandma and Grandaddy watched the kids. Now, I’m not into Star Trek at all, but it wasn’t a bad movie.